Food valley in the region of Emilia Romagna mean intense fragrances and delicious flavors. As a result, this is a region that enjoys an excellent quality of life. In fact, here the culture of good food is synonymous with tradition, friendship, and hospitality. The key to this success lies in the harmonious union between the work of man and the cycles of nature. As well as between cultivation and production, like also processing and distribution. Thanks to these wonderful synergies this region have managed, over the centuries, to guarantee excellent food and wine products. We are in the Northeast of Italy, in a land that goes from the North Apennine mountains to the Adriatic sea. With the Po river and its delta that border the region in the north. Hence the cuisine of Emilia Romagna draws inspiration from ancient cultures and values. As a result, this contributed to the development of a unique gastronomy where ancient farming tradition and the elaborate dishes of the ducal and papal courts from the Middle Ages merge in pleasant harmony. In conclusion, homemade pasta, cured meats, and Parmigiano Reggiano are the undisputed protagonists of the local cuisine. 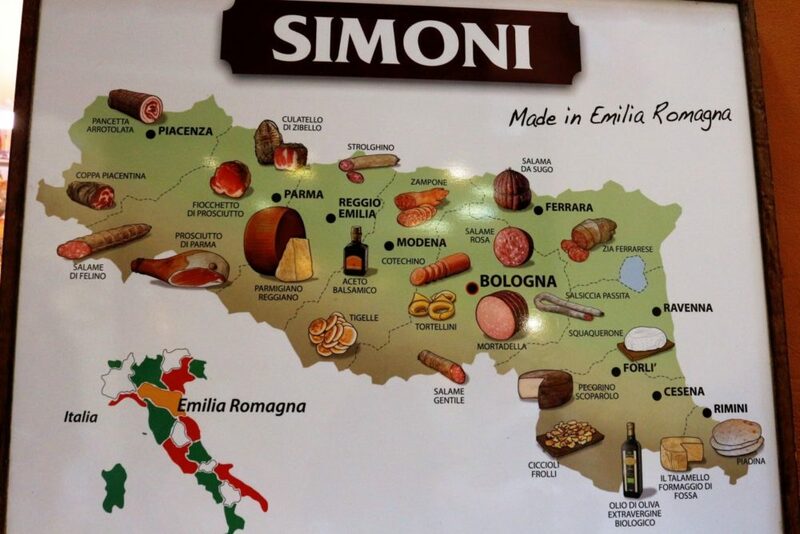 In fact, they contributed to turn the region into the gourmet capital of Italy, the wine food valley Emilia Romagna. The traditional recipes that were handed down from one generation to the next, together with all versions proposed by the local housewives, are now the symbol of the fine Italian food. Cheese and salami factories, wine cellars and the establishments where traditional Balsamic Vinegar from Modena is produced are always open to the public. They give visitors the possibility to undertake outstanding virtual journeys across traditional production processes; and so do the local cooking schools, that teach students how pasta is an art form here. The entire region has a reputation as a great wine-making center, and today mix of modern and traditional techniques is steadily improving the quality of much of the region’s wine. Emilia Romagna region gives the opportunity to visit the most famous cellars, such as Gutturnio, Malvasia, Lambrusco, Pignoletto, Bosco Eliceo, Sangiovese and Albana passito. This page gives you the possibility to undertake an outstanding virtual journey across the genuine wine food valley Emilia Romagna region, in order to discover some of the most famous staples and wine varieties of the so-called Italian “food valley”. The wine and food Emilia Romagna region, to understand the richness of the culinary traditions just below you can find primary products recognized as excellences: a list of PDO and PGI products with the addition of the Slow Food Presidia. It will follow a list of DOCG, DOC and IGT wines. PDO: Coppa Piacentina (Piacenza Cured Pork Neck); Culatello di Zibello Ham; Modena Ham; Pancetta Piacentina (Piacenza Bacon); Parma Ham; Salame Piacentino (Piacenza Salami); Salamini italiani alla cacciatora (typical Italian salami). PDO: Grana Padano Cheese; Casciotta di Urbino Cheese; Parmigiano-Reggiano Cheese; Provolone Cheese; Sogliano Pit-aged Cheese; Squacquerone di Romagna cheese. PDO: Bologna Potato; Voghiera Garlic. PGI: Altedo Green Asparagus; Amarene Brusche di Modena (typical jam); Borgotaro Mushroom; Cherry of Vignola; Emilia-Romagna Pears; Marrone di Castel del Rio (typical chestnuts); Melon of Mantua; Po Delta Rice; Romagna Peach and Nectarine; Romagna Shallots. PDO: Traditional Balsamic Vinegar of Modena; Traditional Balsamic Vinegar of Reggio Emilia. Traditional Balsamic Vinegar Reggio E.
PGI: Coppia Ferrarese Bread; Piadina romagnola bread. DOCG (Controlled and Guaranteed Designation of Origin): Colli Bolognesi Pignoletto; Romagna Albana. DOC (Controlled Designation of Origin): Bosco Eliceo; Colli Bolognesi; Colli d’Imola; Colli di Faenza; Colli di Parma; Colli di Rimini; Colli Romagna Centrale; Colli di Scandiano e di Canossa; Colli Piacentini; Gutturnio; Lambrusco di Sorbara; Lambrusco Grasparossa di Castelvetro; Lambrusco Salamino di Santa Croce; Modena o di Modena; Ortrugo dei Colli Piacentini; Pignoletto; Reggiano; Reno; Romagna.